The hijinks of the proverbial fish out of water has been the source for many works in entertainment. The idea of taking someone from his or her element and then dropping them in an entirely new setting has great comic potential. Even Shakespeare has used the device, in such works as A Midsummer’s Night Dream and As You Like It. The latter even had the dichotomy of country and city life, one of the first examples of which on television being The Beverly Hillbillies. The Beverly Hillbillies had a simple premise, as explained in its theme song – Jed Clampett, played by Buddy Ebsen, finds oil on his land, gets rich, and buys a home in Beverly Hills. Being a dirt poor farmer, Jed never saw modern conveniences. 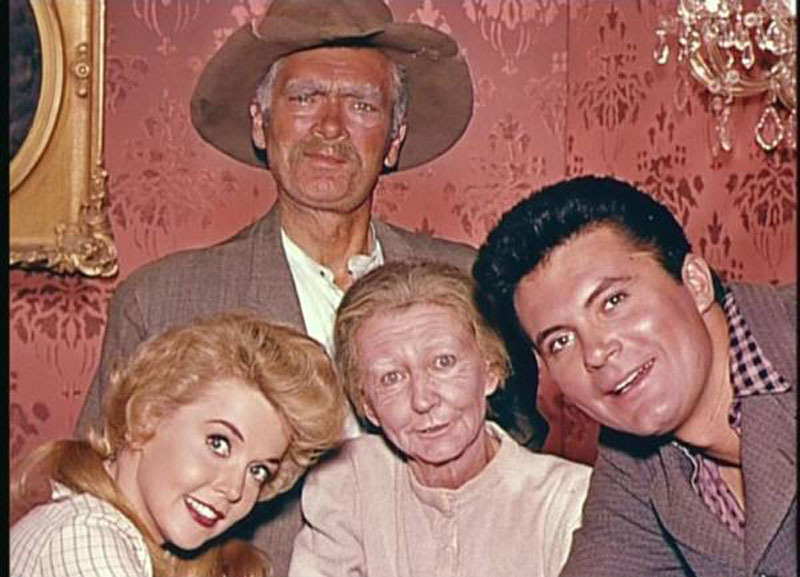 His family, Ellie Mae, Jethro, and Granny, played by Donna Douglas, Max Baer, Jr, and Irene Ryan, weren’t much better; Granny didn’t take to the advances like Jed had, like motor cars. Having a big cement pond, known to most people as a pool, was a source of amazement. Fortunately, Jed had the help of his financial advisor and next door neighbour Milburn Drysdale, played by Raymond Bailey, and his secretary, Jane Hathaway, played by Nancy Kulp. 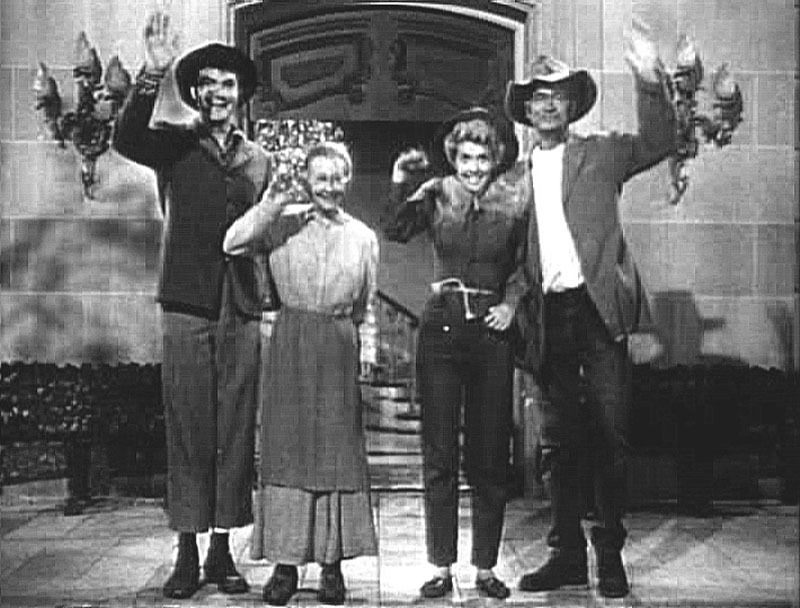 Episodes revolved around the cultural conflict between the Clampetts and the Drysdales, ascerbated by schemes by either Jethro or Drysdale. Jethro’s scheming was more to get the pretty girls of Beverly Hills; Drysdale’s scams involved using Jed’s money to get richer. Not everyone had a conflict. Jane Hathaway was friendly with the Clampetts, even with Granny, and Ellie Mae soothed some rough patches by being her charming self. The series ran for nine years, from 1962 until 1971, switching from black and white to colour in its fourth season. 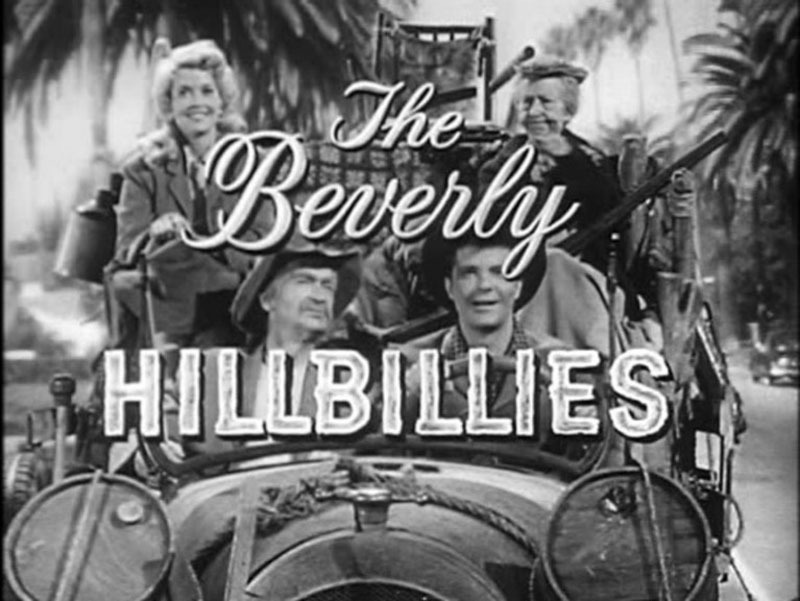 Despite negative reviews from critics, The Beverly Hillbillies was a ratings hit, being the number one show in its early years. Even when it was cancelled, it was in the top third of TV series on the air. CBS, however, bowed to pressure from advertisers who wanted a younger audience and cancelled many of its shows with a heartland theme in what became known as the Rural Purge. Along with The Beverly Hillbillies, other long runners cancelled included Green Acres, Mayberry RFD, The Ed Sullivan Show, and Hee Haw, making way for new series All in the Family, The Mary Tyler Moore Show, The Bob Newhart Show, and M*A*S*H, shows that reflected the social mood of the early 70s. Rural series would return, such as The Dukes of Hazzard in 1979, but they wouldn’t dominate the airwaves as before. The Beverly Hillbillies had a reunion movie in 1981, catching up on where the characters went over the decade since cancellation. The Beverly Hillbillies did make an impact on the mind space of audiences. Even if someone hadn’t seen the show, difficult in the age of syndication, the theme song could easily become an earworm. Even “Weird Al” Yankovic would make reference to the show, releasing the song “The Beverly Hillbillies/Money for Nothing” as part of the soundtrack for 1989′s UHF. Jed Clampett represented the rags-to-riches dream, something that appeals to a wide audience. Naturally, a TV series that had such a wide audience was ripe for being adapted as a feature film. In 1993, that’s exactly what happened. The Beverly Hillbillies was released by Twentieth Century Fox, introducing the Clampetts to the big screen. Casting was a strong point for the adaptation, with a number of comedians and comic actors playing the major characters. Taking over the role of Jed was Jim Varney, best known for playing the character Earnest in the various ads and movies. Meanwhile, Cloris Leachman played Granny, Lily Tomlin portrayed Jane Hathaway, and Dabney Coleman was Mr. Drysdale. Rounding out the cast were Diedrich Bader as Jethro and Erika Eleniak as Ellie Mae. The movie starts in the Tennesee Smoky Mountains, showing the Clampetts at home. Ellie Mae fends off a bear to get wild honey for dinner while Ol’ Jed’s out hunting for food. The hunt is straight from the TV series’ title credits, with crude oil bubbling out where Jed’s missed shot discovers the patch. The first ten minutes of the movie is spent recreating the events of the opening credits, including the theme song, which has one small change. In the original series, Jed’s farm was worth $96 million, in 1962 dollars. The oil crises of the 70s, in 1973 and in 1979, occurred after The Beverly Hillbillies had been cancelled. A barrel of oil, worth $2.85 in 1962, was worth $16.75 in 1993. The movie Jed didn’t become a millionaire; he became a billionaire, and the theme song was modified to reflect the change. While the hills of the Smoky Mountains might not have changed for Jed between 1962 and 1993, Los Angeles had. Culture shock occurred using the modern LA. 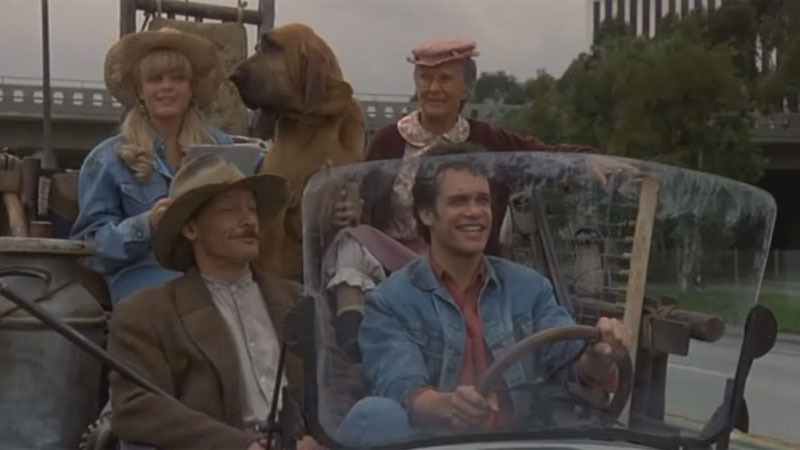 The iconic image of the Clampetts in their old truck on the LA freeways remained, but the reaction to it by drivers changed. Jethro’s truck caused a traffic jam, and while drivers may have fumed in 1962, things got ugly in the early 90s. Shooting incidents between drivers on the freeways hit the news. The movie picked up on it, and one irate passenger in a car that Jethro had cut off was quite willing to express his anger with the aid of a pistol until Jed trumped him with his own shotgun. Meanwhile, Mr. Drysdale is trying to make things welcoming for Jed’s money and for Jed. His assistant, Woodrow Tyler, played by Rob Schneider, also has plans for Jed’s money, plans requiring Jed to not have it. Tyler and his partner in embezzlement, Laura Jackson, played by Lea Thompson, hatch a scheme when they find out that Jed is looking for a wife to help refine tomboy Ellie Mae. Laura becomes French etiquette teacher Laurette Voleur, despite not speaking French, to infiltrate the Clampett estate and woo Jed. Granny discovers the plot while making a batch of her special brand of medicine, known to Revenue Agents as “moonshine”, but Laura and Woodrow kidnap her to have her committed to a retirement home. Miss Hathaway suspects something is up, but is unable to get Jed, who has seen Granny disappear before a wedding before, or the police involved. Jane turns to one of LA’s top private detectives, Barnaby Jones, played by Buddy Ebsen himself, to locate Granny and get her back to the estate before Jed commits to a terrible mistake. While Jed’s the subject of several matchmakers, other subplots are also playing out. Ellie Mae heads off to high school, with Morgan Drysdale, played by Kevin Connolly, showing her around. The high school allowed the film to contrast the Clampetts with the residents of Beverly Hills. The bullies took travellers’ cheques and wire transfers, there was a cappucino vendor in the hallway before class, the girls all had cell phones*. One girl even had a FAX machine in her Porsche. In a movie that could have relied on, “Hey, look at them yokels,” humour, Ellie Mae’s subplot turns the culture shock around, adding the audience’s own shock and expectations to the mix. One of the movie’s main strengths is that it respects the characters from the TV series. While there is some fun poked at Jethro’s lack of smarts, that element existed in the original. Jed is still the calm, wise centre of the family, doing what he can for his loved ones despite his lack of education. And, even with the lack of education, Jed is portrayed as a smart man. The contrast comes from Woodrow Tyler, an educated man without wisdom. The cast was well chosen. Talented comedic actors who understood the roles plus promising young actors presented the script well. The actors suited the roles. Dabney Coleman was ideal as Mr. Drysdale. Cloris Leachman channelled Irene Ryan as Granny. Diedrich Bader turned in a dual role, as Jethro and as his sister, Jethrine, just as Max Baer did in the original series, without turning Jethrine into a charicature. The script captured the feel of an episode of The Beverly Hillbillies, right down to using the closing theme at the end. Tropes that haven’t been used in some time, like the speeding of the film during especially frenetic scenes, were in use as they would have been in the TV series. The cast and crew showed great respect to the original material and actors. The film played out like an episode of the TV series, taking advantage of the 92 minute running time to add scenes of culture shock on the part of the Beverly Hills locals. In short, The Beverly Hillbillies movie was an almost perfect adaptation of the original show. * Today, that’s a given. In 1993, cell phones were mostly used for business purposes, and usually by the higher executives instead of the rank and file. The critical people usually had pagers when they had to be on call.